One of the ways to engage someone in a subject like maths is to show how it can benefit them and their life. I love maths because it is one of the things I did at school that being good at helped. I guess it’s easy for me to say as I come from a line of mathematicians. My oldest son is doing further maths at A-level and still taking it all in his stride. Whether this is genetic or environment will still go undetermined though as I always provide plenty of ways to love maths in the world around us. My 6 year old (year 1) boy is also very good at maths, and numbers, and now needs to think about “real life” problems using them. What better way than to help bag up the change for the bank. I remember being called a miser as a child because I loved to save my pennies, just so I could keep counting them, and making lovely little piles with them. I can so relate to Mr Krabs in Spongebob. The first thing to do is an activity so simple that a young child could do it (make sure not too young and that they do not try and eat the money) – that is sorting. All they have to do is match the same coins and put them into piles – 1ps, 2ps, 5ps, 10ps, and 20ps. Next I wanted all the different types of coins to be in piles of £1, which triggered questions about how many were needed. Starting with the 1ps I asked how many we needed to make one pound. My son told me 100. I explained that it would be easier if we counted the 1ps into 10s. At this point I did not go any further other than my son to help me count out ten 1ps and put them in a pile. We did this until there were no piles left. I then made sure that he understood that there was then 10p in each pile. We then talked about how many piles of 10p we needed to make £1. We then counted out 10 piles of 10 1ps and placed them in a bank bag. I explained how the bags were marked and that you should put the right amounts in the bags before taking them to the bank. We did the same thing with the rest of the money, except that the 5ps, 10ps, and 20ps had to be up to £5. 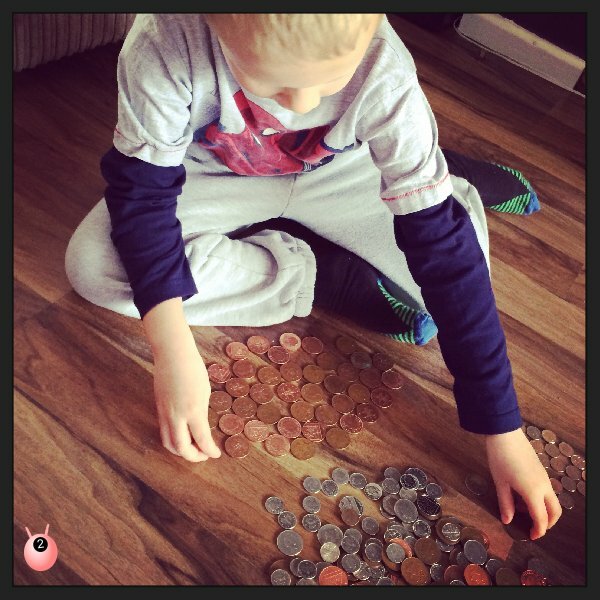 This activity not only helped my son out with sorting, counting and multiplication, but gave him more confidence with money, and one less job for me to do to take the change to the bank. It is so, so important that children connect mathematics with the ‘real world’ and this is a fantastic activity to connect the two. Without an understanding of numbers, maths and money you can get yourself in real financial trouble so starting these lessons early is brilliant. I can’t wait until mine is old enough to sort out our change rather than eating it!! What a fantastic activity and great to get them involved with money from a young age. I have always loved maths and hope my two will be the same. We have a huge pot of loose change that we save up and Ruby really loves sorting and counting it. It makes maths so much more real I think – especially if she gets to spend it too! Mine love playing with the loose change. I just wish it wasn’t so messy. Coins end up everywhere. Great maths activity . My daddy was a bookie and use to xcome back with a hod’bookie bag’ full ofcoins form thr races and it was our job to count them up. Yep! I try and get mine to count their piggy bank money too (they collect spare change from relatives). Such “real life” experience. My kids love doing this too.The older ones like to put the coins in date order and look at the different designs through the years. What a fab idea. My little boy loves counting money. Oooh this is a great idea! Z is too young to do additions just yet and fully understand the concept but he does love money and would love to put things in piles. Hmm I might go hunt out the jars of pennies my hubby leaves around everywhere. We did the same thing at the weekend and I’ve written a post on it too!! We also made pictures with ours as mine are a bit little for all the counting!